The Bag, ammunition, (Mark I.) 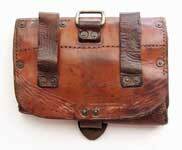 Brown leather was approved on 8th August 1901 as part of the Accoutrements, naval, Pattern 1901 announced by List of Changes paragraph §11110 of 1st July 1902. . It was described as differing from the previous pattern (List of Changes §7576, see KW Sea Service Accoutrements section) in being about one third deeper, the extra depth being made of flexible leather enabling it to be turned up when empty. The Bag, ammunition, (Mark I.) 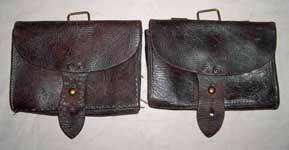 is 7-inches wide by 5-inches high with the bottom (flap) turned up and 8-inches high with the flap down. The sides are gusseted allowing it to expand out to 2-inches deep. Another gusset extends from the left hand side of the bag almost to the centre of the opening, presumably to stop loose rounds from falling out. 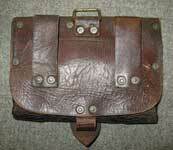 The bag was designed to carry 60 rounds of .303-in. ball and more with the flap down. 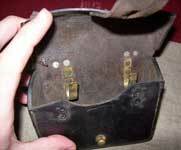 It was recommended that the flap be down if carrying loose rounds. The illustrated example was made by the Commonwealth Government Harness Factory (CGHF) and is marked to the Royal Australian Naval Brigade Victoria. From the Graham Tweeddale Collection, photos © Graham Tweeddale 2011. 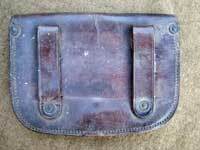 It must have been a successful design as there appear to be no further alterations to the Bag, ammunition recorded in the List of Changes and Bags produced in World War Two are identical, apart from a more substantial brass loop, to those made 40 years earlier. Shown left is a pair of Bags, ammunition by Hebbert & Sons Ltd, C&M, 1901 from the Chris Pollendine Collection, photos © Chris Pollendine 2011. For comparison, a WWII example by Barrow, Hepburn & Gale, 1941. From the John Lamont collection. Photos © John Lamont 2011. 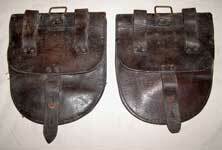 At left is shown a Canadian made Bag, ammunition (Mark I.) by Riley & McCormick 1916. From the Fred Hazel Collection. Photographs © Ross Torrington 2012. It is interesting to note that the Bandolier, naval (Mark I.) 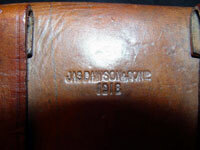 was the first British service accoutrement designed to carry .303-in. ammunition in chargers and that it predated the introduction of the first charger loading rifle, the Rifle, short, magazine, Lee-Enfield (Mark I), by nearly 18 months! 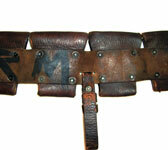 This early bandolier is maker marked "TCG" (T.C. Galley) and dated 1902. From the Chris Pollendine Collection, photos © Chris Pollendine 2014. The Bandolier, naval (Mark I.) 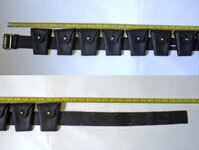 was around 51-inches long and consisted of 12 individual pockets riveted to a 1 ¾-inch wide backing strap. 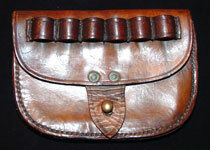 The separate steady strap was attached through a slot between the 5th and 6th pockets. 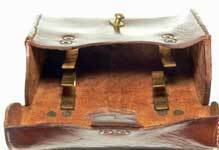 Adjustment for fit was achieved by means of double tongued brass buckle & seven pairs of holes. The loose end of the Bandolier was secured by a free running loop. 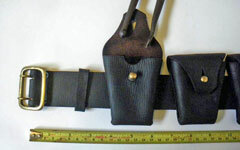 This example is missing 3 pockets, the steady strap and about 2-inches from the end. From the James Harriss collection, photos © James Harriss 2011. The Bandolier. (Mark II.) 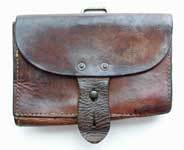 Brown leather, 60 rounds, with steadying strap was approved early in 1903 and announced by List of Changes paragraph §11659 of 1st July 1903. . It was described as differing from the previous pattern (L. of C. §11110) in that the Bandolier was cut on the curve so that it would fit better on the wearer’s shoulder and that the steadying strap was riveted to the dee. No further changes were made to the design until January 1918 after whichLoC §20764 announced that the pattern of the Bandolier. (Mark II.) 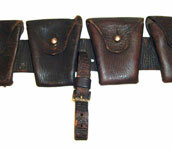 Brown leather, 60 rounds, with steadying strap had been modified for future manufacture. 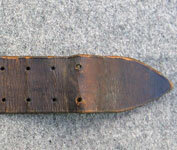 It differed from the previous pattern (L. of C. §11659) in that the tongue of the buckle was fitted to the centre bar instead of being brazed to a tube working on the centre bar. 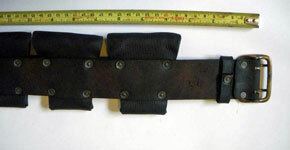 The KWRT have been unable to date locate an example of a Bandolier (Mark II.) 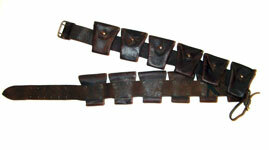 with the modified buckle. The first of the illustrated examples is by T. C. Galley 1904 and is from the Graham Tweeddale collection. Photos © Graham Tweeddale 2011. This second example, which unfortunately has been shortened (there should be a special place in Hell for people who cut down bandoliers!) 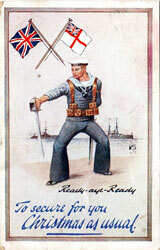 by 4-inches and has thus lost its maker's marks, is marked to the RNVR. Photos © John Lamont 2011. 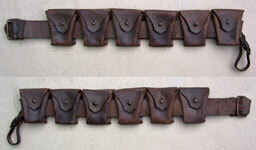 Additional details of the RNVR marked Bandolier. (Mark II.) 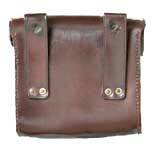 Brown leather, 60 rounds, with steadying strap. Pouch, cartridge, pistol. (Mark I). 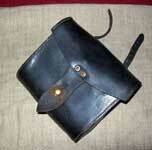 The Pouch, cartridge, pistol. (Mark I.) 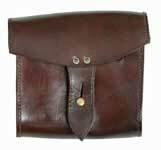 Brown leather was approved on 8th August 1901 as part of the Accoutrements, naval, Pattern 1901 announced by List of Changes paragraph §11110 of 1st July 1902. 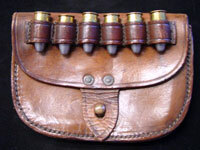 It was described as being a small open Pouch to carry ammunition in packets with six loops (each to take one cartridge) fitted to the front of the flap. No further L. of C. entries for the Pouch, cartridge, pistol, have been located. The fitting instructions in Rifle & Field Exercises for HM Fleet 1913 claim that it takes 48 rounds in 8 packets plus the 6 in the loops giving a total of 54 rounds. With external dimensions of 5¾-inches wide by 4-inches high by around 1½- inches deep, with the gusset expanded, 8 paper wrapped packets of 6 would be a very tight fit indeed, particularly in a CGHF made example examined, which is only 1⅛-inches deep! Illustrated left is an example by W. Jenkinson & Co 1916. From the Graham Tweeddale Collection, photos © Graham Tweeddale 2011. 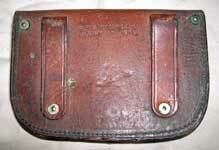 This second example is Canadian made by Riley & McCormick Ltd. Calgary 1916. From the Chris Pollendine Collection, photos © Chris Pollendine 2011. 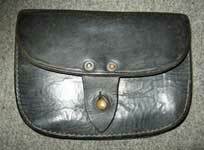 This 1918 dated pouch is very nicely finished. 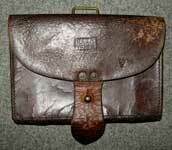 It is English made and maker marked "JAS DAWSON & SON LD." 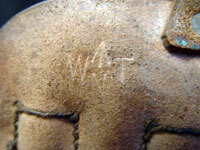 Note the naval mark - W [broad arrow over N] T. From the Leo Fackler Collection, photos © Leo Fackler 2012. 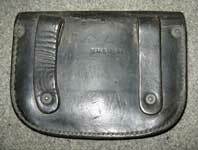 The Pouch, cartridge, pistol. (Mark I) is known to have had a long life with World War 2 dated examples existing. Interestingly, the World War 2 dated examples do not have the external loops on the flap, yet the KWRT have not been able to find any reference to the design change. It has not even proved possible to estimate when the change took place as no Pouches dated between 1918 & 1941 have been sighted. 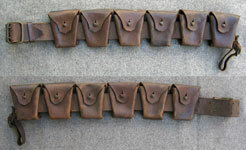 Some of the earlier Pouches have been noted with the loops missing, but it is not known if this is the result of deliberate modification or the loops just falling off due to rotted stitching. If any reader can point us to any official documentation concerning the change in design and / or the modification of existing Pouches the KWRT would love to hear from you. The illustrated example, in unissued condition, is by BHG (Barrow Hepburn & Gale) 1941. From the Simon Moore collection, photos © Simon Moore 2011. 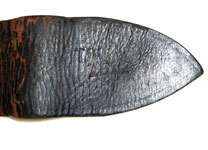 Although World War 2 examples are normally brown this one, also BHG 1941, has been dyed black at some stage, by whom & for what reason is unknown. The blacking of brown leather articles was forbidden under the Royal Navy Queens Regulations 1899, and again, if any reader knows of any official instruction contrary to this, please let us know. From the Graham Tweeddale collection. Photographs © Graham Tweeddale 2011. 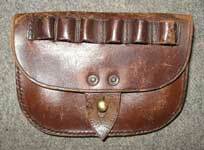 An example of an early Pouch with its loops removed, as discussed above. As you can see, in this case the tongue has been replaced as well. 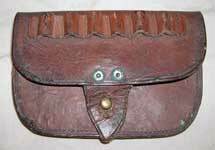 This very early Pouch was apparently in service for a long time, and, in keeping with naval policy, was repaired when required. Waste not, want not! 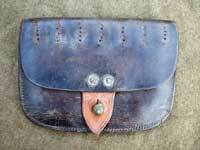 The Pouch is maker marked Martins Birmingham and dated 1902. 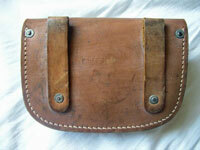 From the Paul Laidlaw Collection, photos from the WD Militaria website. 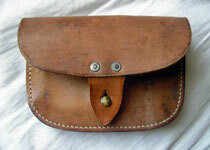 Pouch, cartridge, pistol, Mark I. The Accoutrements, naval, pattern 1912 consisted of only two items, the Case, pistol and the Pouch, cartridge, pistol, and were intended to be worn with the with the Accoutrements, naval, pattern 1901, hence their inclusion here. 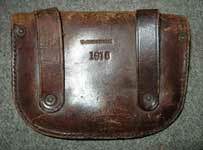 The Pouch, cartridge, pistol, Mark I. 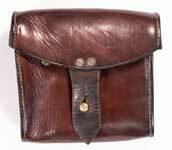 Brown leather was approved on 31st May 1912 and announced as part of the Accoutrements, naval, Pattern 1912 by List of Changes paragraph §16043 of 1st August 1912. It was designed to carry 49 rounds in 7 packets plus 2 spare magazines (charged, 7 rounds each) giving a total of 63 rounds. The magazines were held below the top opening of the Pouch by four spring clips. 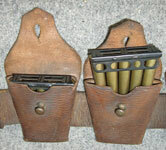 The position of the magazines was intended to minimize the loss of ammunition from the Pouch. 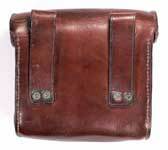 The Pouch, cartridge, pistol measures 5 ½-inches wide by 5 ½-inches high by 2 ¼-inches deep. Interestingly, Rifle and Field Exercises for H M Fleet 1913 states that, in addition to the 2 magazines the Pouch carries 77 rounds in 11 packets. Experimental archaeology by KWRT member Peter Smith has shown this to be impossible, with 7 packets (packet substitutes) as per L. of C. §16043 being a tight fit, let alone any more! While the reference to 11 packets is most likely just an error in the R&FE Fitting Instructions, we must leave the question open - there is always the possibility that this comment refers to a hitherto undiscovered pattern or variation of Pouch. The illustrated example is completely unmarked, with no manufacture, inspection or naval markings; however it did originally come from the family of Midshipman Felix Mossop RNR, of the Motor Launch Patrol. Midshipman Mossop was awarded the Belgian Croix de Guerre after the raid on Zeebrugge. From the Peter Smith collection. Photos © Peter Smith 2011. 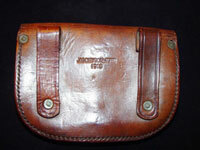 Another example of the Pouch, cartridge, pistol, Mark I, also completely unmarked. From the John Bodsworth collection. Photos © John Bodsworth 2011. This next example is maker marked “J.A. Hillman Ltd.1915”. 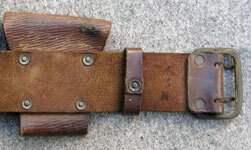 Unfortunately it has had two magazine clips removed & some additional straps riveted to the belt loops. It is most likely that these are post service life alterations. From the Edward Hallett collection. Photos © Edward Hallett 2011. 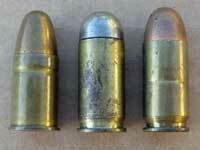 Near right, a 7 round packet of Cartridges, S.A., ball, pistol, self-loading, Webley and Scott, .455-inch (Mark I). Far right, the Webley and Scott, .455-inch (Mark I) cartridge is in centre, with the .455-inch Webley revolver round (left) and the .450-inch ACP (Automatic Colt Pistol) round (right) for comparison. From the Terry Hawker Collection. Photographs © Terry Hawker, 2010. Pockets, cartridge, rifle. (Mark I). The Pockets, cartridge, rifle. (Mark I.) Brown leather, 45 rounds. was approved on 20th December 1904 and announced by List of Changes paragraph §12697 of 1st April 1905. 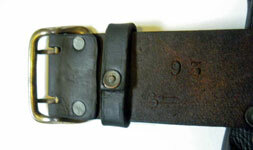 It was described as having three 15-round pockets similar to the pattern 1903 pockets mentioned in L. of C. §12389 but of leather the same shade of colour as the rest of the P’01 naval accoutrements and riveted to a band of leather forming an elongated loop for attachment to the Waist belt. It was intended that these articles would supersede the Bags, ammunition. This is about the sum total that the KWRT knows about the Pockets, cartridge, rifle. No other official reference has been sighted, no photos of them in use have been seen, nor are there known to be any surviving examples. This, coupled with the fact that the item it was to replace remained in production and in the Fitting Instructions of 1909 & 1913, leads us to the conclusion that it was never adopted. The reason why may well be lost to history, but it might have something to do with the Royal Navy not getting the quantities of charger loading rifles that they were, perhaps, expecting. If any reader has any information on, or even an example of a Pocket, cartridge, rifle, then we at KW would love to hear from you. While we don’t have a photo of an original, based on the L. of C. description the Pocket, cartridge, rifle should look something like the mockup (by Graham Tweeddale) shown above. As an alternative, though, Simon Moore recently sent us a photo of the WW I era postcard shown at right above, suggesting that this might represent the Pockets, cartridge, rifle. (Mark I.). This drawing shows pockets in a one over two configuration, rather than in-line as we have proposed, and the pockets don't follow the pattern 1903 design mentioned in L. of C. §12697. We tend to believe this illustration is much more artist's license rather than reality, but at this point, who can say for sure?